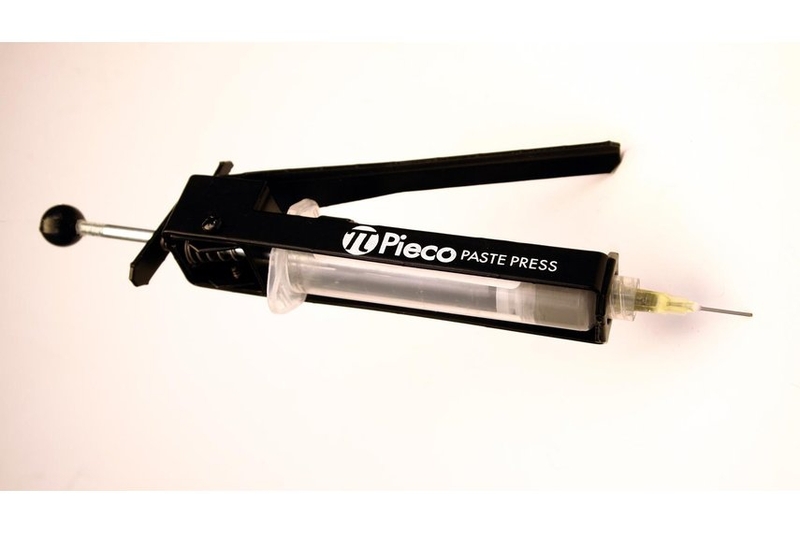 The Pieco Paste Press allows you to accurately dispense solderpaste or other high-viscosity liquids, pastes and gels easily, accurately and affordably. No more bruised fingertips, or cramped hands - the Paste Press lets you apply your materials effortlessly and quickly, with fingertip control. The Paste Press has been tested with dispensing needles as fine as 30 gauge - that's small enough to place solder paste on fine pitch component pads, individually, and passives as small as 01005 - if your hand is steady enough! No more fear of bridging - with the Paste Press, you put solder paste where you want it, exactly. 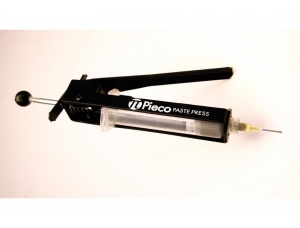 The Pieco Paste Press accepts any standard 10cc syringe housing (one included) and works with any dispensing needles that fit your syringe (one 20 gauge needle included). The Paste Press features all-metal construction, and perfectly balances in you hand. Slight pressure from a single finger allows you to put just the right amount of material where you want it. The Paste Press ships with instructions, one syringe, one syringe wiper, and a 20 gauge dispensing needle, suitable for all solderpaste formulations.